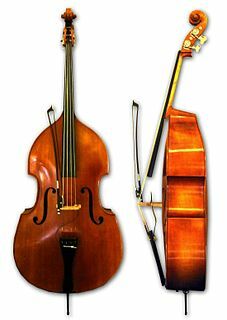 The double bass, or simply the bass, is the largest and lowest-pitched bowed string instrument in the modern symphony orchestra. 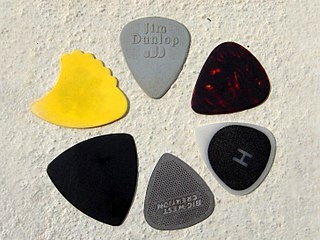 A guitar pick is a plectrum used for guitars. Picks are generally made of one uniform material—such as some kind of plastic, rubber, felt, tortoiseshell, wood, metal, glass, tagua, or stone. They are often shaped in an acute isosceles triangle with the two equal corners rounded and the third corner less rounded. They are used to strum chords or to sound individual notes on a guitar. Since the 1960s, the bass guitar has largely replaced the double bass in popular music as the bass instrument in the rhythm section. While types of basslines vary widely from one style of music to another, the bassist usually plays a similar role: anchoring the harmonic framework and establishing the beat. Many styles of music include the bass guitar, and it is occasionally a soloing instrument. A transposing instrument is a musical instrument whose music is recorded in staff notation at a pitch different from the pitch that actually sounds. A written middle C on a transposing instrument produces a pitch other than middle C, and that pitch identifies the interval of transposition when describing the instrument. For example, a written C on a B♭ clarinet sounds a concert B♭. 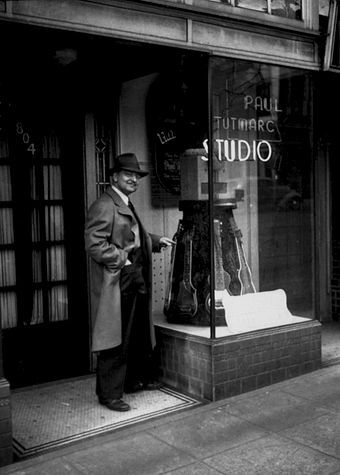 Paul Tutmarc was an American musician and musical instrument inventor. He was a tenor singer and a performer and teacher of the lap steel guitar and the ukulele. He developed a number of variant types of stringed musical instruments, such as electrically amplified double basses, electric basses, and lap steel guitars. His second marriage was to his former student Bonnie Buckingham, known as Bonnie Guitar. In the 1950s, Leo Fender and George Fullerton developed the first mass-produced electric bass guitar. The Fender Electric Instrument Manufacturing Company began producing the Precision Bass in October 1951. The "P-bass" evolved from a simple, un-contoured "slab" body design and a single coil pickup similar to that of a Telecaster, to something more like a Fender Stratocaster, with a contoured body design, edges beveled for comfort, and a split single coil pickup. In 1953, following Fender's lead, Gibson released the first short-scale violin-shaped electric bass, with an extendable end pin so a bassist could play it upright or horizontally. Gibson renamed the bass the EB-1 in 1958. Also in 1958, Gibson released the maple arched-top EB-2 described in the Gibson catalogue as a "hollow-body electric bass that features a Bass/Baritone pushbutton for two different tonal characteristics". In 1959 these were followed by the more conventional-looking EB-0 Bass. The EB-0 was very similar to a Gibson SG in appearance (although the earliest examples have a slab-sided body shape closer to that of the double-cutaway Les Paul Special). A number of other companies also began manufacturing bass guitars during the 1950s: Kay in 1952, Hofner and Danelectro in 1956, Rickenbacker in 1957 and Burns/Supersound in 1958. 1956 saw the appearance at the German trade fair "Musikmesse Frankfurt" of the distinctive Höfner 500/1 violin-shaped bass made using violin construction techniques by Walter Höfner, a second-generation violin luthier. The design was eventually known popularly as the "Beatle Bass", due to its endorsement and use by Beatles bassist Paul McCartney. In 1957, Rickenbacker introduced the model 4000,  the first bass to feature a neck-through-body design in which the neck is part of the body wood. The Fender and Gibson versions used bolt-on and glued-on necks. Introduced in 1960, the Fender Jazz Bass was first known as the "Deluxe Bass," intended to accompany the Jazzmaster guitar. The "J-bass" featured two single-coil pickups, one close to the bridge and one in the Precision bass's split coil pickup position. The earliest production Jazz basses had a "stacked"[ further explanation needed ] volume and tone control for each pickup; this was soon changed to the familiar configuration of a volume control for each pickup, and a single passive tone control. The Jazz Bass's neck was narrower at the nut than the Precision bass — 1 1⁄2 inches (38 mm) versus 1 3⁄4 inches (44 mm) — allowing for easier access to the lower strings and an overall spacing and feel closer to that of an electric guitar, allowing trained guitarists to transition to the bass guitar more easily. Another visual difference that set the Jazz Bass apart from the Precision is its "offset-waist" body. Some makers have used graphite composite to make lightweight necks  e.g., Status brand basses, which are made from graphite. The first known fretless bass guitar was made by Bill Wyman in 1961 when he converted a used UK-built ‘Dallas Tuxedo’ bass by removing the frets and filling in the slots with wood putty. Wyman's early fretless bass can be heard on The Rolling Stones songs such as "Paint It, Black" and "Mother's Little Helper" from 1966. He is seen recording with the instrument in the 1968 film One Plus One a.k.a. Sympathy for the Devil. The first production fretless bass was the Ampeg AUB-1 introduced in 1966, and Fender introduced a fretless Precision Bass in 1970. Around 1970, Rick Danko from The Band began to use an Ampeg fretless, which he modified with Fender pickups—as heard on the 1971 Cahoots studio album and the Rock of Ages album recorded live in 1971. Danko said, "It's a challenge to play fretless because you have to really use your ear." In the early 1970s, fusion-jazz bassist Jaco Pastorius coated the fingerboard of his de-fretted Fender Jazz Bass in epoxy resin, allowing him to use roundwound strings for a brighter sound. Pastorius used epoxy rather than varnish to obtain a glass-like finish suitable for the use of roundwound strings, which are otherwise much harder on the wood of the fingerboard. Some fretless basses have "fret line" markers inlaid in the fingerboard as a guide, while others only use guide marks on the side of the neck. The standard design for the electric bass guitar has four strings, tuned E, A, D and G,  in fourths such that the open highest string, G, is an eleventh (an octave and a fourth) below middle C, making the tuning of all four strings the same as that of the double bass (E1–A1–D2–G2). This tuning is also the same as the standard tuning on the lower-pitched four strings on a six-string guitar, only an octave lower. Some bassists use unusual tunings to extend the range or get other benefits, such as providing multiple octaves of notes at any given position, or a larger tonal range. Instrument types or tunings used for this purpose include basses with fewer than four strings (one-string bass guitars (Japanese manufacturer Atlansia offers one-, two- and three-stringed instruments  ), two-string bass guitars, three-string bass guitars [tuned to E–A–D]) (Session bassist Tony Levin commissioned Music Man to build a three-string version of his favorite Stingray bass) and alternative tunings (e.g., tenor bass). Tuned A–D–G–C, like the top 4 strings of a six-string bass, or simply a standard four-string with the strings each tuned up an additional perfect fourth. 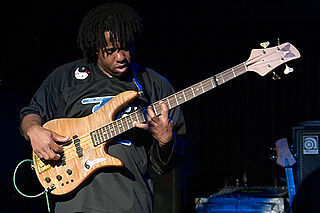 Tenor bass is a tuning used by Stanley Clarke, Victor Wooten, and Stu Hamm. A piccolo bass resembles a four-stringed electric bass guitar, but usually tuned one full octave higher than a normal bass. The first piccolo bass was constructed by luthier Carl Thompson for Stanley Clarke. 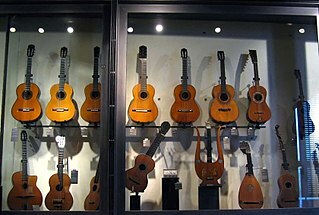 [ citation needed ] To allow for the raised tuning, the strings are thinner, and the length of the neck (the scale) may be shorter. Several companies manufacture "piccolo" string sets that, with a different nut, can be put on any regular bass. Slap and pop style is also used by many bassists in other genres, such as rock (e.g., J J Burnel and Les Claypool), metal (e.g., Eric Langlois, Martin Mendez, Fieldy and Ryan Martinie), and jazz fusion (e.g., Marcus Miller, Victor Wooten and Alain Caron). Slap style playing was popularized throughout the 1980s and early 1990s by pop bass players such as Mark King (from Level 42) and rock bassists such as with Pino Palladino (currently a member of the John Mayer Trio and bassist for The Who),  Flea (from the Red Hot Chili Peppers), Billy Gould (from Faith No More) and Alex Katunich (from Incubus). Spank bass developed from the slap and pop style and treats the electric bass as a percussion instrument, striking the strings above the pickups with an open palmed hand. Wooten popularized the "double thump," in which the string is slapped twice, on the upstroke and a downstroke (for more information, see Classical Thump). A rarely used playing technique related to slapping is the use of wooden dowel "funk fingers", an approach popularized by Tony Levin. In the two-handed tapping styles, bassists use both hands to play notes on the fretboard by rapidly pressing and holding the string to the fret. Instead of plucking or picking the string to create a sound, in this technique, the action of striking the string against the fret or the fretboard creates the sound. Since two hands can be used to play on the fretboard, this makes it possible to play interweaving contrapuntal lines, to simultaneously play a bass line and a simple chord, or play chords and arpeggios. Bassist John Entwistle of The Who tapped percussively on the strings, causing them to strike the fretboard with a twangy sound to create drum-style fills. [ citation needed ] Players noted for this technique include Cliff Burton, Billy Sheehan, Stuart Hamm, John Myung, Victor Wooten, Les Claypool, Mark King, and Michael Manring. The Chapman Stick and Warr Guitars are string instruments specifically designed to play using two-handed tapping. Strumming, usually with finger nails, is a common technique on acoustic guitar, but it is not a commonly used technique for bass. However, notable examples are Stanley Clarke's bass playing on the introduction to "School Days", on the album of the same name,  and Lemmy who was noted for his use of chords, often playing the bass like a rhythm guitar. Chucking uses the soft part of the forefinger and the nail of the forefinger to alternately strike the string in an up-down manner. [ not in citation given ] The thumb supports the forefinger at the first joint, as though using an invisible plectrum. With a flexible wrist action, chucking facilitates rapid rhythmic sequences of notes played on different strings, particular notes that are an octave apart. Chucking is distinguished from plucking in that the attack is softer with a sound closer to that produced by the use of fingers. Chucking allows a mix of plucking and finger techniques on a given song, without having to take up or put down a plectrum. Chords are not used that often by electric bass players. However, in some styles, bassists may sound "double stops", such as octaves with open strings and powerchords. In Latin music, double stops with fifths are used. Robert Trujillo of Metallica is known for playing "massive chords"  and "chord-based harmonics"  on the bass. Lemmy of Motörhead often played power chords in his bass lines. In the 1960s, The Who's bassist, John Entwistle, performed a bass break on the song "My Generation" using a plectrum. He originally intended to use his fingers, but could not put his plectrum down quickly enough. [ citation needed ] This is considered one of the first bass solos in rock music, and also one of the most recognizable. ↑ Tom Wheeler (1978). The Guitar Book. HarperCollins. pp. 101–2. ISBN 978-0060145798. ↑ Tom Evans, Mary Ann Evans (1977). Guitars:From the Renaissance to Rock. Unknown. p. 342. ISBN 978-0709209874. ↑ "Audiovox #736: The World's First Electric Bass Guitar!". Vintage Guitar. March 1999. ↑ "Audiovox and Serenader Amps". Vintageguitar.com. Retrieved February 17, 2019. ↑ Interview with Chuck Rainey, Bass Heroes, ed. Tom Mulhern, 1993, pp165. ↑ H.), Roberts, Jim (James (2001). How the Fender bass changed the world. Backbeat Books. ISBN 0-87930-630-0. OCLC 46319707. ↑ "Gibson EB-1偺晹壆" . Retrieved March 29, 2015. ↑ "Gibson EB2 Bass" . Retrieved March 29, 2015. ↑ "history of the violin bass" . Retrieved March 29, 2015. ↑ "Rickenbacker Bass Models and Specifications: The 4000 Series" . Retrieved March 29, 2015. ↑ "Jack Bruce: Cream of the Crop". fenderbassplayer.com. Retrieved March 29, 2015. ↑ "The Gibson EB-3". vintageguitar.com. March 10, 2010. Retrieved September 5, 2017. ↑ Womack, Kenneth (November 21, 2016). The Beatles Encyclopedia: Everything Fab Four. ABC-CLIO. p. 220. ISBN 1440844275 . Retrieved January 18, 2018. ↑ "Dallas Tuxedo Bass - The Guitar Collection". ↑ "Atlansia Bass". Atlansia.jp. Retrieved February 17, 2019. ↑ "Interview – Igor Saavedra – For Bass Players Only". For Bass Players Only. Retrieved March 29, 2015. ↑ Amador, Valery (July 1, 2011). "Warwick releases Jeroen Paul Thesseling's 7-string fretless bass". Bassmusicianmagazine.com. Retrieved May 30, 2018. ↑ Johnson, Kevin (November 17, 2011). "Ultra Low: An Interview with Jeroen Paul Thesseling". Notreble.com. Retrieved May 24, 2018. ↑ Beller, Bryan (May 11, 2012). "Machines of Death: Four Extreme Metal Bassists Lay Out Their Weapons of Choice". Bassplayer.com. Retrieved May 26, 2018. ↑ "An Aristocracy of Artistic Instrument". Jerzydrozdbasses.com. Retrieved February 17, 2019. ↑ "Novax Guitars website" . Retrieved October 24, 2018. ↑ Andy Irvine. "FANNING THE FLAMES WITH SHELDON DINGWALL" . Retrieved October 24, 2018. ↑ "Torzal Guitars website" . Retrieved October 25, 2018. ↑ Jisi, Chris (2006). "The Master Stylist". Bass Player Magazine Online Edition. New Bay Media, LLC. Archived from the original on February 2, 2009. Retrieved December 27, 2008. ↑ Nile Rodgers (2011). Le Freak: An Upside Down Story of Family, Disco, and Destiny. Spiegel & Grau. p. 114. ISBN 978-0-385-52965-5. ↑ "Bernard Edwards "Chucking" Bass Technique". Bestbassgear.com. May 5, 2015. Retrieved February 17, 2019. ↑ Jaime Vazquez. "Bass Lines by Jaime Vazquez – Adventurous Bass Playing Part II". Bass Musician Mag. Retrieved March 29, 2015. ↑ Warwick Robert Trujillo Signature Bass. February 19, 2012 in basses, Featured By G.M. Jameson. "Robert Trujillo Demands Something Solid" Available at: http://www.rottenbass.com/warwick-robert-trujillo-signature-bass-57 Accessed on June 24, 2013. ↑ Metallica Bassist Robert Trujillo Funding Jaco Pastorius Biopic Posted April 6, 2012 by Damian Fanelli Available online at: http://www.guitarworld.com/metallica-bassist-robert-trujillo-funding-jaco-pastorius-biopic Accessed on June 24, 2013. ↑ Interview by Ronen Givony, from the sleeve notes of Steve Reich, Double Sextet/2x5, Nonesuch Records (2010). 1 2 3 "BERKLEE | Bass Department". Berklee.edu. Archived from the original on February 13, 2010. Retrieved February 7, 2010. ↑ "Humber College | Music". Postsecondary.humber.ca. Archived from the original on September 17, 2009. Retrieved February 7, 2010. ↑ "Contemporary Double Bass" (PDF). Retrieved February 7, 2010. Wikimedia Commons has media related to Bass guitars . The acoustic bass guitar is a bass instrument with a hollow wooden body similar to, though usually larger than a steel-string acoustic guitar. Like the traditional electric bass guitar and the double bass, the acoustic bass guitar commonly has four strings, which are normally tuned E-A-D-G, an octave below the lowest four strings of the 6-string guitar, which is the same tuning pitch as an electric bass guitar. The fingerboard is an important component of most stringed instruments. It is a thin, long strip of material, usually wood, that is laminated to the front of the neck of an instrument. The strings run over the fingerboard, between the nut and bridge. To play the instrument, a musician presses strings down to the fingerboard to change the vibrating length, changing the pitch. This is called stopping the strings. Depending on the instrument and the style of music, the musician may pluck, strum or bow one or more strings with the hand that is not fretting the notes. On some instruments, notes can be sounded by the fretting hand alone, such as with hammer ons, an electric guitar technique. The Fender Jaguar is an electric guitar by Fender Musical Instruments characterized by an offset-waist body, a relatively unusual switching system with two separate circuits for lead and rhythm, and a medium-scale 24" neck. Owing some roots to the Jazzmaster, it was introduced in 1962 as Fender's feature-laden top-of-the-line model, designed to lure players from Gibson. During its initial 13-year production run, the Jaguar did not sell as well as the less expensive Stratocaster and Telecaster, and achieved its most noticeable popularity in the surf music scene. After the Jaguar was taken out of production in 1975, vintage Jaguars became popular first with American punk rock players, and then more so during the alternative rock, shoegazing and indie rock movements of the 1980s and 1990s. Fender began making a version in Japan in the mid-1980s, and then introduced a USA-made reissue in 1999. Since then, Fender has made a variety of Jaguars in America, Mexico, and China under both the Fender and Squier labels. Original vintage Jaguars sell for many times their original price. 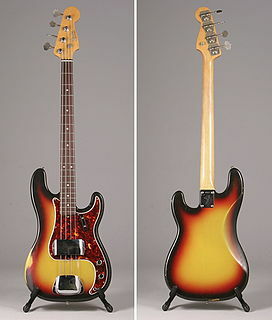 The Jazz Bass is the second model of electric bass created by Leo Fender. It is distinct from the Precision Bass in that its tone is brighter and richer in the midrange and treble with less emphasis on the fundamental frequency. It has a more focused tone than the Precision Bass, with less low end and low midrange. The sound of the Jazz Bass has been fundamental in the development of signature sounds in certain musical genres, such as funk, disco, reggae, blues, progressive rock, heavy metal and jazz fusion. The body shape is also different from the Precision Bass, in that the Precision Bass has a symmetrical lower bout on the body, designed after the Telecaster and Stratocaster lines of guitars, while the Jazz Bass has an offset lower bout, mimicking the design aesthetic of the Jaguar and Jazzmaster guitars. Jazz bass is the use of the double bass or bass guitar to improvise accompaniment ("comping") basslines and solos in a jazz or jazz fusion style. Players began using the double bass in jazz in the 1890s to supply the low-pitched walking basslines that outlined the chord progressions of the songs. From the 1920s and 1930s Swing and big band era, through 1940s Bebop and 1950s Hard Bop, to the 1960s-era "free jazz" movement, the resonant, woody sound of the double bass anchored everything from small jazz combos to large jazz big bands. The electric upright bass (EUB) is an instrument that can perform the musical function of a double bass. It requires only a minimal or 'skeleton' body to produce sound because it uses a pickup and electronic amplifier and loudspeaker. Therefore,a large resonating structure is not required to project the sound into the air. This minimal body greatly reduces the bulk and weight of the instrument. EUBs must always be connected to an amplifier and speaker cabinet to produce an adequate audible sound. However,the EUB retains enough of the features of the double bass so that double bass players are able to perform on it. The Fender Jaguar Bass is an electric bass guitar manufactured in Japan and China by the Fender Musical Instruments Corporation. The Fender Performer was an electric bass guitar released in 1985 and discontinued in 1987, assembled in the United States and Japan. The Performer was also available as an electric guitar. The Fender American Deluxe Series was a line of electric guitars and basses introduced by Fender in 1998 and discontinued in 2016. It was upgraded in 2004 and 2010 before being replaced by the American Elite series in 2016. The Yamaha Corporation is a multinational corporation and conglomerate based in Japan with a wide range of products and services, predominantly musical instruments, motorcycles, power sports equipment and electronics.